One of the volunteer projects that is dear to Don’s heart is the work he does with The Raincoast Conservation Foundation. 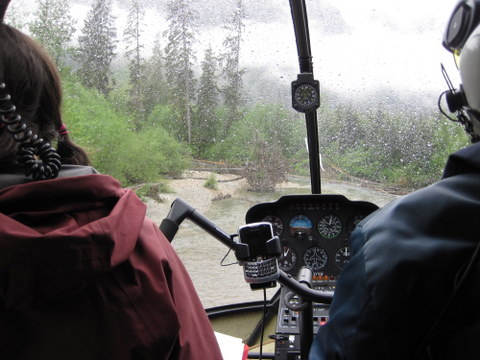 He donates his time and expertise to fly researchers to remote areas of BC via his helicopter so that they can do environmental/ biological/ ecological studies. The field crew has just ended the final round of helicopter sites. I stayed on terra firma for this round, and as such the past few days have taken on a more relaxed pace. With my feet firmly on the ground and with time to reflect on the weeks gone by my head has been in the clouds (apologies for the cheesy mixed metaphor) thinking back to the first two rounds of helicopter travel when I was fortunate enough to be part of the heli-crew. Fond memories of these experiences quickly transitioned to an appreciation for the man who made them possible, a long-time Raincoast supporter and team member named Don Arney. One of the many remote sites made accessible by Don and "Gizmo". It might seem crazy to try numerically evaluating a person’s contribution to this project. However, I’m a number-crazed ecology geek so here goes: Of our 72 study sites, 29 require helicopter access. In our first round of sampling, these 29 sites yielded 313 of the total 487 hair samples. Put another way, Don’s contribution yielded 64% of the 487 bear hair samples collected. While this was an extremely impressive gift, it wasn’t his only. Apologies for another cheesy metaphor, but Don lifted not only our bodies and gear with his flying machine, but also our moods and spirits with his presence. He not only flew us to our sites, but also helped us with our work upon arrival. While lending his hand with the grunt work Don always kept a keen eye peeled for improvements to our protocol. In minutes, he would devise ingenious improvements that hadn’t occurred to us after days or even weeks. While sharp-minded, Don was also thick-skinned and dealt with the rigours of fieldwork with his characteristically cheerful attitude. For instance, one day he had an unfortunate incident when a can of bearspray accidentally discharged in his pocket. The pepper reacted strongly, resulting in a patch of skin going blood-red. While such an accident would have left me curled up on the ground and sobbing like a baby, Don simply changed his pants, laughed, and got back to work. Just one of the many incidences in which his calm, measured composure helped turn a potentially dismal situation into a light tale to be retold over a jovial dinner later that night. I don’t know whether or not the fates will allow me to return to this remarkably rich part of the world to help with this valuable project next year. Either way, one of my fondest memories from my time here will be of days zipping around with Don and Gizmo, collecting bear hair samples from what are likely some of the most beautiful and ecologically valuable places on this coast.